'Twas the day before Christmas, and Bouchon was closed. The Keller crew left early, so Fat Bruce Lee and I were hosed. We wandered the streets--for a burger joint we searched. We spotted The Farm and through the front door we lurched. We ordered our burgers condiment-free and Medium. What was set before us was a different outcome. 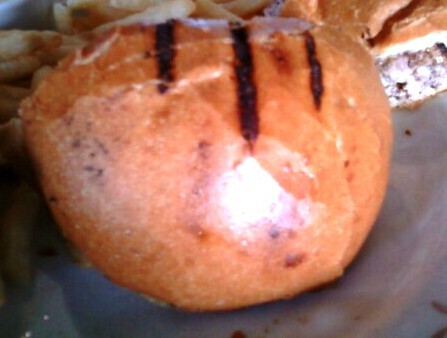 Over-cooked burgers on burnt buns were handed to us. After three, dry bites mine was returned in disgust. But after eating half, he too cried, "Enough!" The beef was bland, and the cheese was not bold. The fries were cooked in oil that was far too old. The tomatoes were unripe and mealy. The whole meal had us asking, "Really?" They comped my burger, because it was bad. They charged Fat Bruce Lee due to how much he had. This was one of the worst burger, which we have sampled yet. I would not return to The Farm on a bet. The Beef: The menu touted Certified Humane Meyer Natural Angus. That was a lot of adjectives to describe some ground Chuck, but it could have been good. It was not. This was bland, dry Chuck--the overcooking to Well Done did not help. The Sear: The sear from the grill was actually pretty darn good. Granted, they overcooked the beef by 25 degrees to get that sear on it. The burger patty was actually steaming when I opened the bun. In spite of the good color from the sear, it did not matter. The beef was so dry and rubbery from the overcooking that any texture of the sear was lost in the bite. The Seasoning: There was no seasoning--none. The Preparation: The beef was pre-ground to a medium grind. It showed up that way in a box that way from Meyer Natural Angus in Colorado. The fact that it had traveled across 1/2 of the continent already ground and packed in a tube pretty much guaranteed that it would not be tender--the proteins were given plenty of time to make new friends in the back of the truck. The Cheese: This was a very bland, aged yellow Cheddar. The dryness of the beef overwhelmed any creaminess that the Cheddar could have contributed. 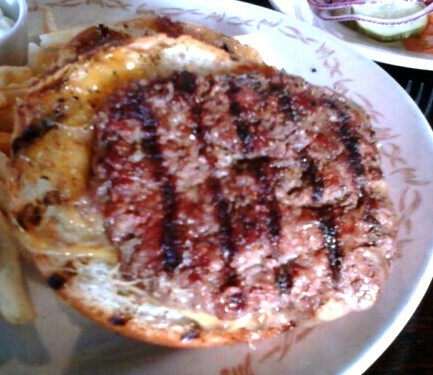 The Bun: A big, brioche-style burger bun, which had been toasted/burnt on both sides. They burned grill marks into both sides of the bun, so that the whole thing was permeated with the scorched taste of carbon/burnt starch. This was along the lines of eating a bag of burnt popcorn or blackened toast. 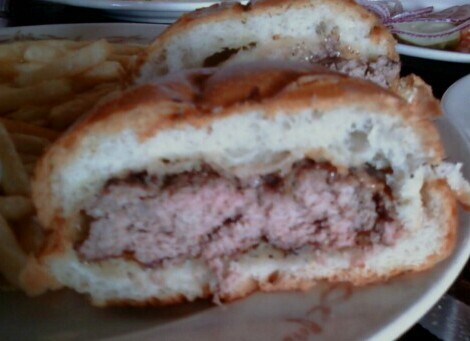 Meat to Bun Ratio: The over-sized bun dwarfed the shriveled, dry puck of a patty. The Fries: They were peel on, shoestring fries, which were lightly battered, so they were very nicely crisped. Sadly, the fries were cooked in deep fryer oil, which had a bitter, burnt taste, so the aftertaste was wretched. Interestingly, this was not nearly as bad as the burnt taste of the bun, so the fries were downright pleasant by comparison. The Value: $14.95 for a cheeseburger, which was inedible. The value was so bad that I imagine the kitchen staff laughed whenever an order for a burger came in. Fat Bruce Lee summoned all of his Chi and mightily choked down half of his cheeseburger. I took three bites, and I sent mine back--you are what you eat, and I did not want to be a crappy burger. They did not charge for my burger, because it was clearly overcooked. Wolfgang's Steakhouse is dangerously close to The Farm Of Beverly Hills, so no one ever needs to go to there for a burger--never again. Burger Review : You are welcome! We choked that nasty thing down, or at least tried to, so you will never have to. The Farm was an apt name for this burger, which tasted like a chicken coop and was every bit as edible. Rating...1 Bite Just don't go to The Farm Of Beverly Hills for a cheeseburger. 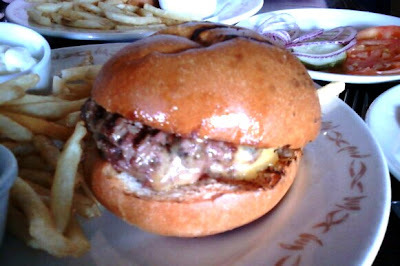 Though it's been a couple years, and it was at The Grove location, I had a truly exceptional burger there. Don't doubt that yours sucked like ol' Saint Nick. But I wonder if the whole operation, and burgers in particular, have gone down hill that much. Or if you just caught a bad one on a bad day. In any case...I'm moved to try them again, just to find out. But thanks for taking one for the team. I'll give Bouchon a shot and then try this one again. Honestly, other things leaving the kitchen were unimpressive, too. The calamari appetizer was devoid of seasoning. The chicken fried steaks were way too dark, and they only had about a tablespoon of gravy in the center. I think these guys may be on autopilot.